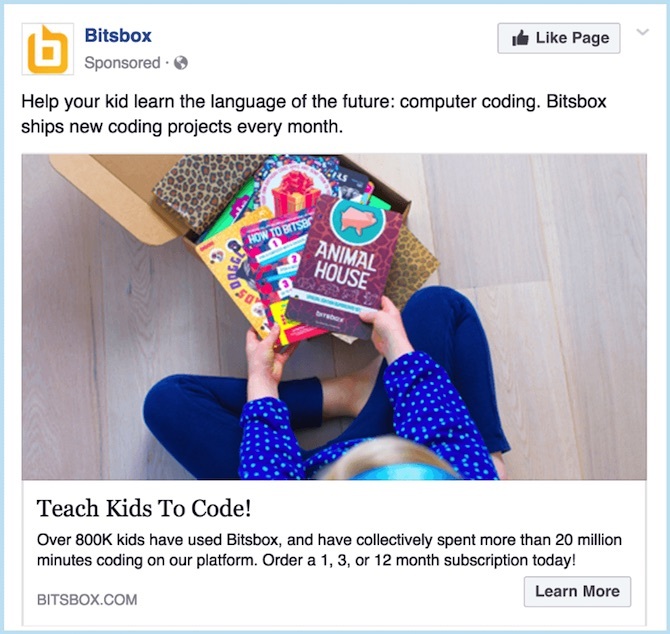 Whether your Facebook ad is designed to build your email list, drive traffic to a particularly high-converting piece of content, or make a sale outright, it needs to do one thing spectacularly well: Drive the right kinds of traffic to whatever page you specify. Your ad's performance usually is highly attributable to images. However, that doesn't mean that you should feel yourself constrained by stock image sites. 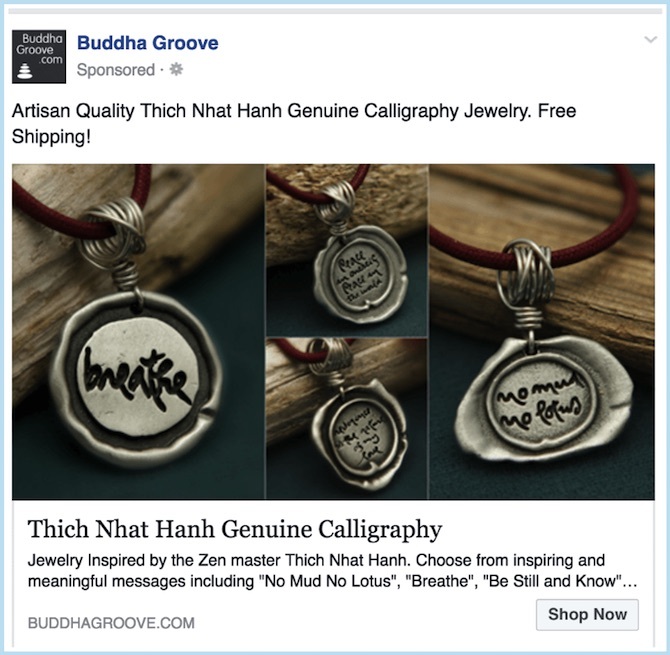 In this ad, BuddhaGroove offers a specific line of jewelry. Of course the company could just have relied on some tired, cliched stock image of a woman doing yoga, or anything “zen”. Instead, the store created separate images, to keep the visual focus on each individual pendant. In order to tie them all together, the images were created using similar backgrounds and props. No stock image would ever be able to achieve the same impact. Takeaway: Consider creating your own images for your ad, instead of relying on stock photos. With the plethora of easy-to-use image editing apps available today, you can turn even the most amateur photo into something visually striking and compelling for your ads. The Body Shop is a well-known skincare and beauty retailer that's evolved nicely into the digital commerce era. This ad is proof. It does a number of things well, but let's focus on the way the ad conveys the brand's UVP (unique value proposition). The image illustrates the brand's natural aesthetic and philosophy both in color and composition. 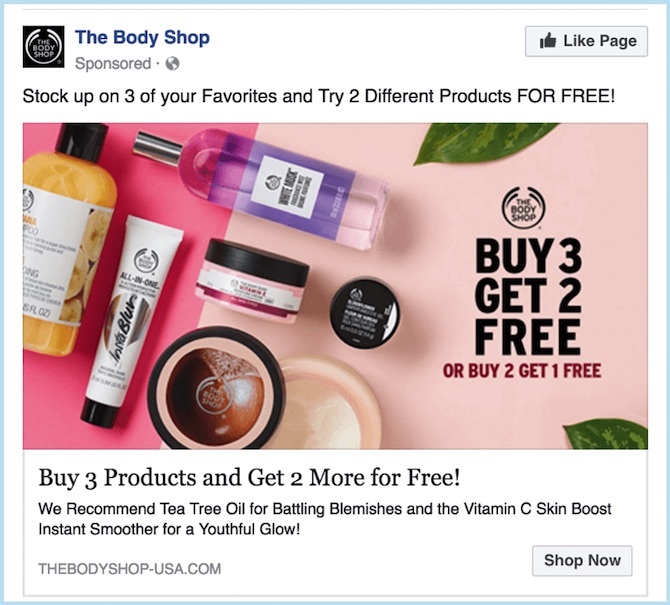 The image and the copy together clearly communicate the benefit to the prospect who sees this ad: the opportunity to try two new products for free with the purchase of three products. Takeaway: Embrace your UVP and communicate it clearly to your prospects, not only with your ad copy but also in your image. The call to action above the button is likewise clear: “Order a … subscription today!” The lesson? Also clear: if you want your prospect to do something, you'd better eschew cleverness and instead, tell them precisely what that is. Takeaway: Don't beat around the bush. Tell your prospects exactly what you want them to do, in plain, direct language. Far too many mid- and high-price point brands shy away from mentioning prices in ads. Vaughan‘s ad here takes another approach altogether. By embracing the luxury status of its silk shirts for women and not shying away from mentioning the price, it pre-qualifies its prospects. 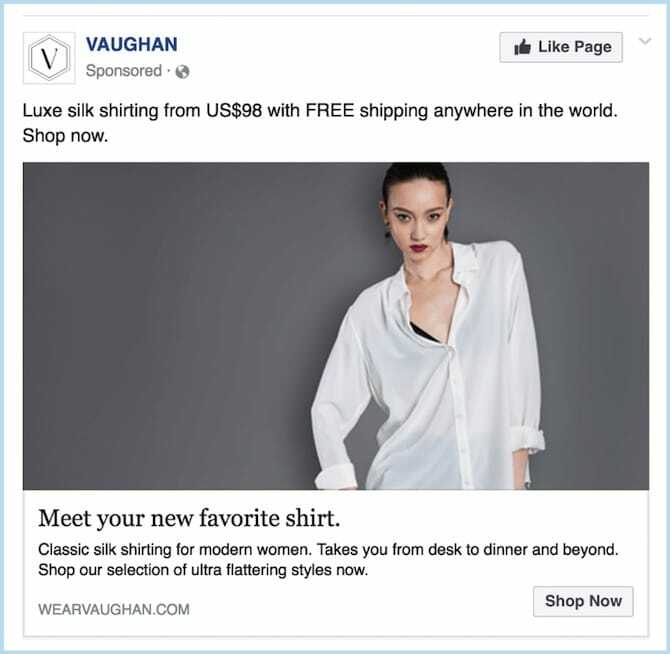 Vaughan's ad helps its prospective customers self-select out if they're not going to make a purchase. Takeaway: Mentioning price isn't the same thing as competing on price. With higher priced or luxury goods, an ad that accurately discloses price points can help your conversion rate. 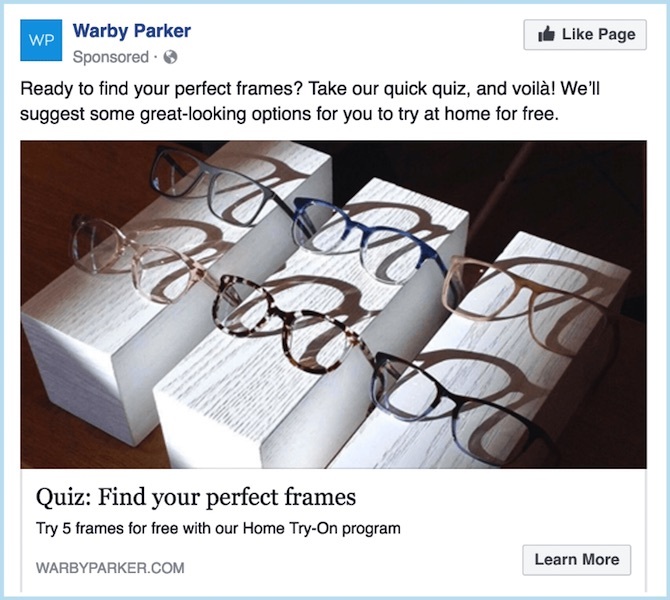 Warby Parker asks for clicks in this ad by promising something fun: a quiz. And who doesn't love a quiz? That's especially true when the payoff is “your perfect _____”. Whatever you offer, if it's something deeply personal and style-dependent (like eyeglasses), a good quiz designed to recommend a personalized solution to your prospect will be highly enticing. Takeaway: To drive traffic to your site, create an interactive element such as a quiz, then use that at the target link in your ad. If you can tie it to a personalized solution or recommendation, so much the better. 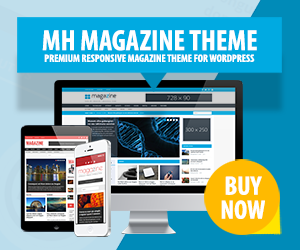 This is not only fun, but may lead to additional revenue and traffic as well. 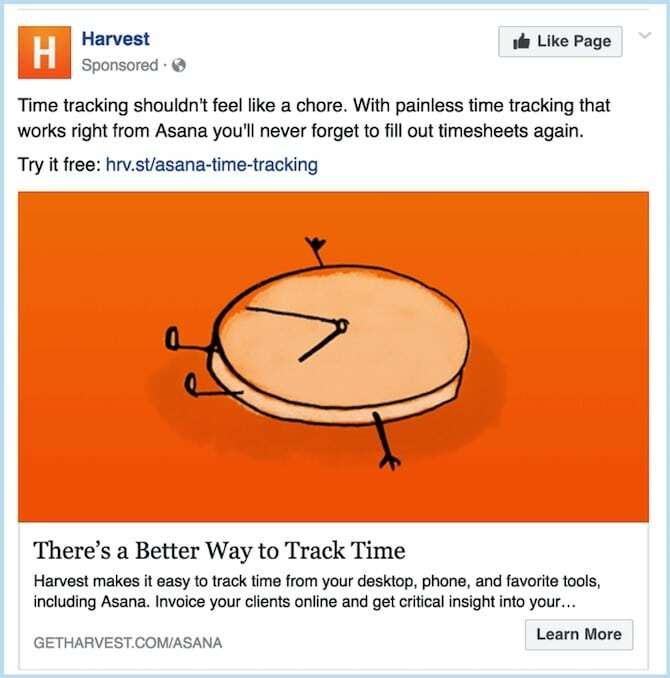 Harvest, a time tracker and invoicing tool, gets right to the painful point with this ad. From the drawing of the exhausted, collapsed clock to the likening of time-tracking to a “chore”, the ad copy and image work together to highlight, call out, and promise to assuage the prospect's chief pain points. This can be a great aproach to attract your prospect's attention. Takeaway: Don't shy away from your prospect's pain. Call it what it is. Be plainspoken about it. Then hint at your promised solution; as long as you can actually deliver on that promise, your ad campaign is likely to yield results. HoneyBook is a SaaS provider of back-end office solutions for solo and small business owners, offering features ranging from proposals to payments. 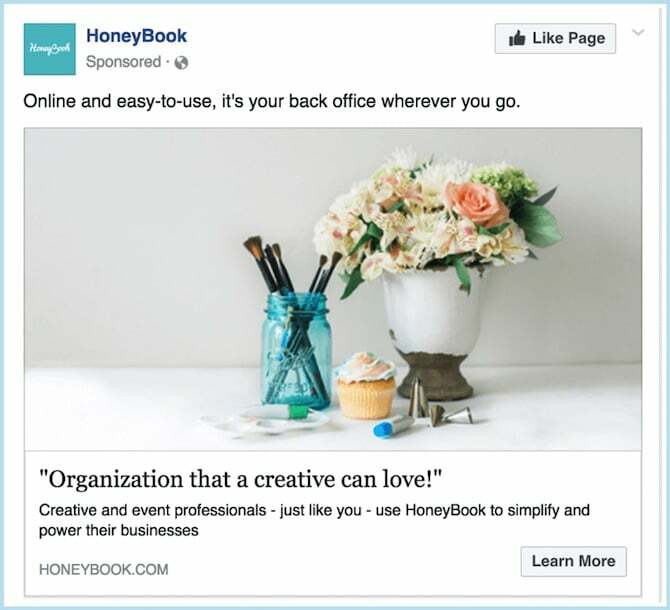 Yet in this ad, HoneyBook is going for a narrow slice of that larger market pie: the creative types. The ad accomplishes that both explicitly and implicitly. The copy expressly calls out to creatives – twice! – by name, of course, but it also uses an image with a composition and color scheme that creatives will almost certainly be drawn to. From cupcakes to flowers to paint brushes in blue-tinged Mason jars, this image speaks to an artistic soul. Takeaway: Don't just pick any old stock image. Give the composition and color scheme some thought. Think about what your targeted audience will be drawn to. 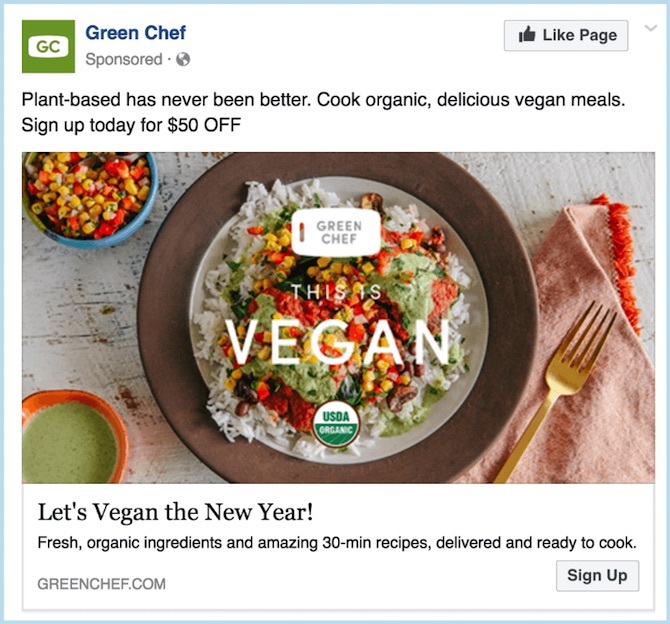 GreenChef embraces the green in an ad celebrating the food-delivery brand's offering of vegan menus. The color green is popularly associated with a vegan or vegetarian lifestyle. It serves to reinforce both the brand name itself as well as its unique value proposition: “green” meals with fresh, organic ingredients. Notice also that the other major color tone in this ad is orange? That's not an accident, we feel sure. Orange has been shown to trigger the appetite in human beings. Takeaway: Adopt a color scheme that evokes the right kind of emotional response in your prospects. Speaking of orange … let's get to the next example. 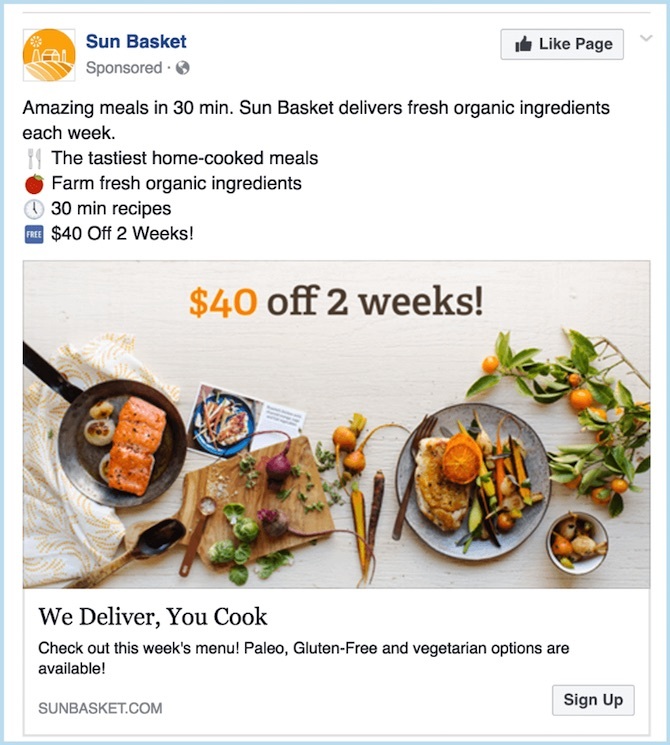 Sun Basket gets major social savvy points for many aspects of this visually appealing ad – note especially the great use of the color orange as a unifying accent? However, here we want to focus on one aspect in particular: its creative use of emojis. Using context-appropriate emojis as bullets for that bullet-pointed copy helps focus the user's eye on those points in a creative way. But they also humanize the food-delivery brand in a direct, no-cost way. After all, who doesn't use emojis? Well, undoubtedly some folks don't, but Sun Basket does, which will also help reinforce its connection to a younger market base. It's important to narrowly target your Facebook ads. These examples show that's a process that extends to the creative side of your ad campaign. 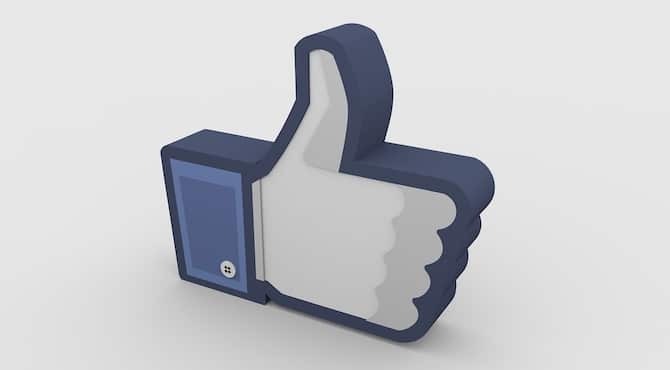 Which of these strategies will you use in your Facebook ads? Do you have any other ideas? Tell us in the comments below.